Thanks to the powers of Google to augment my memory to superhuman levels, it was May of 2010 that a film called AKA Blondie first came to my attention. Communications Director at the time, I was manning our social media channels via my myriad of screens--more a function of personality, than true function. So it was likely a tweet that alerted me to the fundraiser at Eyedrum to support the film. The Blondie of AKA Blondie is an Atlanta fixture. Dancing at the Clermont Lounge for over 30 years, she had become a local celebrity with a level of national notoriety thanks to her ballsy no-nonsense, performance (PBR can crushing being her signature), and poetry. Like many true-hearted Atlantans, I have spent many a late, late, late Saturday night at Clermont with friends. I've even shepherded festival filmmakers to this true Atlanta original. A search may lead you to photographic evidence of one these sojourns. So I was fully aware of who Blondie was. No thanks to the powers of Google--exercise those brains kids--I can't remember if it was the summer or fall of 2011 when AKA Blondie again came to my attention via a tweet. Transitioning into programming, my "atlanta film" and "atl film" search terms were still assisting me, this time bringing to my notice local films to track for the 2012 Atlanta Film Festival. If there's a no-brainer of films to consider slotting in this city, AKA Blondie is the primary case study to test how much brain activity a programmer has. A festival thrives on its ability to bring out a crowd to put butts in seats. Drawing an audience is a must. Drawing an audience to a bad film is silly. Drawing an audience to a film about an exotic dancer that is awful and misogynistic is off the charts nuts. First thing I did was hunt down the trailer. Immediately, any fears that the filmmakers had cynically shot a film they knew would be an easy sell in their hometown melted away. A trailer is one thing. A good film is another. Using my Google-fu, I found the website for the company producing the film, Half Pint Productions. The director, Jon Watts, wasn't a name I recognized. Sending him a short, snappy email, I told him I was interested in the film and I was curious where he was with it. A few days later I hadn't gotten a response, so I once again used my Google-fu, found Jon's phone number and called. I think he was a little shocked that I had called. He was going to submit to the festival he told me and they were coming close to a finished film. When that would be he didn't know. I told him I'd followup later. Every few weeks I checked in and Jon would give me the latest update. They were focused on making the film as strong as possible, so they weren't ready to show it to anyone. Totally understandable, I'd followup. Sometime around November, I started getting nervous. It wouldn't have been a big deal to have a film I hadn't seen yet not in the festival. It's not like the film couldn't play the year after that. But I really wanted to be the premiere. IT'S. BLONDIE. If the film was good, I'd be pretty bummed that we didn't get it first. Just as I was starting to move on, Jon called me and said he had a copy of the film to send us. I hid my glee to not sell or oversell that the film was a lock to get in. Even during the first phone call I told him that there were no guarantees that we'd play the film. Taking the film home I tentatively watched it. Strong trailers have seduced me, while their respective films have disappointed me before--one in particular hinted at a great story, only for that story to be only about 10 minutes of the entire film...don't bait and switch. Anyhow, If the picture and title above isn't an indication, I dug the film*, we screened it before a sold out, energized audience at The Plaza. Blondie worked her magic on the crowd, the Clermont Lounge staff came out in full force to support the film, and Jon, Brantly and Alex's families and friends got to see their work on the big screen. The film played two more times and did so well Jonny Rej, former owner of The Plaza gave AKA Blondie a week run, which extended into a two week run it did so well. Post-festival I caught up with Jon and Brantly. They told me, while they loved seeing the films, they, as well as their editor/co-producer Alex, really found the Filmmaker Lounge and the Happy Hours at The Independent to be their favorite part of the fest. New to the Atlanta film scene, they spent a good deal of their time in the Lounge getting to know Mike Malloy (Eurocrime) and Michael Perkins (The Booker). Finding kindred spirits, that turned into an informal documentary group, that met regularly at Manuel's Tavern. If there's one thing that gets me excited, it's hearing that filmmakers not only connected at the fest, it's that they then took that connection even further. Their meetings didn't have a singular purpose. It was a space to talk about where they were in their careers, talk shop, and discuss ideas. I praised them both for being proactive after the festival. A documentary friend of mine and I had been talking about a documentary group for a while. They had just got up and straight did it. Having an open invitation, I made it to out a few of the meetings (drinks after non-profit work? yes, please). At one of those, Jon, Brantly, Mike, Michael and Alex laid out the general idea that would become Homespun. They all wanted to keep making documentaries, none of them wanted to commit to a feature. All at different points in their careers, they also wanted to develop something that could showcase their talents and be used to open doors. What stood out was Brantly recounting a moment after the AKA Blondie premiere. Someone thanked them for showcasing Atlanta. Brantly instantly understood what they meant. She was a native Georgian, but she hadn't grownup in Atlanta. It had taken Brantly awhile before she found her footing after she moved, but once she started getting into the nooks and crannies, she discovered a city that was far from generic. This was her home in every sense of the word and she'd defend it's honor from those, mostly Northerners--and maybe South Floridians with their beaches, who would besmirch it. That same spring Jon and Brantly joined our screening committee for the 2013 festival, so I saw them quite a bit. Actually, I had already seen them often before that. If there was an ATLFF event and they were free, they were there. They became members. They went on to sit on our jury for the festival. I was a little bit proud when Brantly told me how much the documentaries we had put into competition had made her bawl like a baby. A few weeks later they emailed saying they wanted to meet with my programmer Kristy Breneman and I to tell us about a new project they were working on. We met, where else, at Manuel's Tavern. That's where they told us about Homespun. Focusing on Atlanta, it would introduce folks to the characters that make this city what it is. It would be Homespun's mission to find the quirky, the interesting, and the passionate. While Jon and Brantly would be filming their own documentaries, Homespun would be open to any filmmaker who wanted to feature an Atlanta character. The only stipulations, it had to be a quality film, and it had to include the Homespun graphics to keep it consistent. What they needed from us was some support. Just putting the films online wouldn't be enough. They'd get watched for sure, but Jon and Brantly really wanted the films, not just their own, but every Homespun film to be treated as special. The city of Atlanta had embraced them at the festival and that feeling of being part of something larger than themselves, of being welcomed to the wider Atlanta community, that was a feeling they wanted to share. So they floated the idea of screening the films during the festival. Kristy and I thought for a second, and while we did think a fest screening was an awesome idea, Homespun needed something to standout and to help it stand on its own. We batted around ideas of screening at The Plaza sometime in the fall, once they had the first three films done. The Plaza was a must include in the equation. It was important these films screen in the same venue AKA Blondie had. Its where that feeling of community felt strongest for all of us. If we're going to put the focus on local filmmakers, and give people a chance to meet the subjects of Homespun in person, this is where the screening had to happen. We got to planning the first Homespun screening. That first screening is this Friday. Yet, this story has a few more components. My cousin, a Gwinnett county teacher, wanted her 4th and 5th grade students to do a documentary on the last year of their school. They already had the equipment, she needed guidance on how to get that started. I emailed Jon and my friend Darija Pichanick, who was the one I wanted to start the documentary group with, and connected them all. A conference call later, Jon and Darija setup a meeting with my cousin at the school to assess if the project was truly doable. It obviously was, because for the last two months or so, Jon and Darija meet with the students every two weeks to assist them. It's project based learning, so the students are having to do everything. Over email, they plan out the next steps to help the students. I was even able to rope in Ed Adams from Creative Loafing to go up and talk to the kids about interviewing people. What brings a smile to my face is that my cousin called me that evening after she had met Jon and Darija and told me she they were amazing. She said the same after chatting with Ed. Apparently I roll in good company. 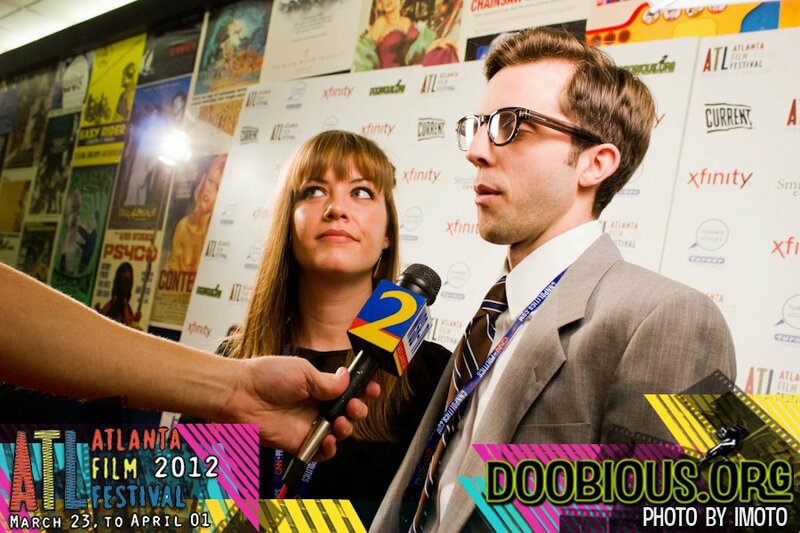 We at ATLFF had been trying to figure how we could outreach to and service schools. A call from my cousin, and Jon and Darija's willingness to go all in, had set the template for a mentor program that could be replicated. What I'm most proud of is that Jon and Brantly, who felt embraced by this city of ours, returned the favor and upped the ante. They helped create something that would show that Blondie is not alone. She's just one of countless numbers whose uniqueness and energy drive this city. They have continuously put a focus on assisting other filmmakers (that whole doc crew, including a few I didn't mention here, have to). The filmmakers from 2013 fest selection The Suicide Kid they friended when they were both at the Macon festival. Jon, Brantly and Cameron McAllster from Reel Georgia, showed them such a good time and ATL love, those filmmakers were ready to move--Cameron said one of them seriously started working on making it happen. We at the Atlanta Film Festival have made Jon and Brantly unofficial artists in residence, a long with a good number of other filmmakers who we've come to work closely and often with. What I hadn't anticipated was that a phone call would be the start of a friendship I cherish and that, while it has a creamy film community center, is independent of ATLFF. I can easily say Jon and Brantly exemplify "local characters, resonating stories." They are Atlanta. *I skipped over receiving the drive with the film in the middle of the street. Two blonde women, one being Brantly, driving up just a tad bit fast, handing an odd looking package to a bald black man without getting out of the car, and taking off after 30 short seconds in downtown Atlanta, isn't a good look.